The HRDC will dedicate its full programme of five historic races at the Castle Combe 'Historica' meeting on 9 April to the achievements of Alan Mann, who sadly passed away on 21 March. HRDC Race Director Julius Thurgood relays: "Alan Mann was a great friend and mentor to me and his encouragement towards the formation of the HRDC was inspirational, especially when the going was tough. His consistent encouragement and conviction that the HRDC ethos of serving the historic race driver was worthy of his support has inspired me to take this project forward to the highest level. "Alan will be greatly missed by all in the racing fraternity, but especially so by all the friends and allies that he made latterly in the historic sector. Hopefully, in time, his son Henry will continue with Alan's plan to run the Alan Mann Racing Ford Prefect 107E in HRDC Touring Greats this season. It would never do to lose the evocative and inspiring sight of the Alan Mann Racing livery in historic racing. Because of Alan's universal popularity in the HRDC Paddock, it is therefore fitting that the HRDC dedicates all five of its races at Castle Combe to the memory of the many extraordinary achievements and the generosity of spirit that were the hallmarks of this great man." A specially commissioned trophy dedicated to Alan Mann will be awarded by the HRDC at this meeting, to the competitor/team that displays the key elements of Alan Mann's racing philosophy: "Preparation, Determination, Presentation and Skill". 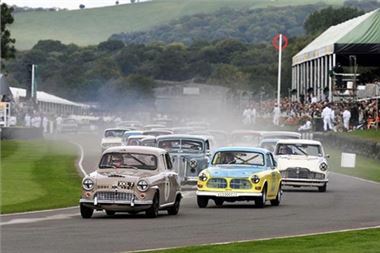 Some 47 entries alone have been received for the headline HRDC 'Touring Greats' 45-minute race event, which bodes well for a fantastic day of historic racing at this traditional April 'Must Do' meeting at the friendly Castle Combe venue this coming Easter Monday. :: HRDC 'TOURING GREATS' for pre-'60 historic touring cars. :: HRDC 'GRAND TOURING GREATS' for pre-'66 historic GT cars under 1500cc. :: HRDC 'TC63' for pre-'64 historic touring cars. :: HRDC 'GTS65' for pre-'66 historic GT cars over 1500cc. :: HRDC 'MGB50' for pre-'66 historic MGB cars.